Sophie Anderson was born in Shepparton, to an Australian mother and an American father. When Sophie was eight years old her brother was kidnapped from their home. His body was found a year later. This led to Sophie’s sense of justice – and her desire to help, and protect people through law enforcement. After becoming a qualified psychologist she joined the Victoria Police Force. Sophie quickly worked her way up to homicide and her uncanny ability to crack cases was rewarded. Seven years after joining the force, the Victoria Police sent Sophie to the FBI Academy for its prestigious International Training Program. The formal training, particularly the lectures on profiling, interested her greatly and it was there that she met Andy Rivers, the head of the Behavioral Analysis Unit. Rivers was workshopping a case and quickly noticed Sophie’s clever questions and insights. Rivers was impressed and later offered her a job when he found out she had dual citizenship. Sophie packed up her things, said goodbye to her family, friends and boyfriend and flew to Washington DC to start her new life. 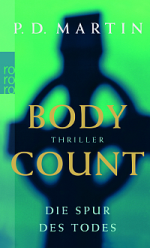 Body Count opens seven months later. As a child, Sophie often ‘guessed’ things – like who was on the phone, where her mother’s missing keys were, etc. When Sophie started having nightmares about her brother, John, the family assumed it was the normal nightmares of a child. But then John was abducted and murdered. After this traumatic event, Sophie repressed her psychic abilities for years – until she became involved in a particularly nasty serial killer case in Washington DC. Once again, her vivid nightmares returned, this time accompanied by waking visions – snippets of a much larger picture. Sophie is conflicted by her gift. At times she’s hopeful that she’ll be able to use it to help others, maybe save lives, but it also frightens her because she either plays the role of victim or perpetrator in the visions. As victim, she feels their fear and pain, and as perpetrator, she often feels the killer’s pleasure during the horrific act of murder – neither is desirable, yet she knows she can’t walk away from her visions.